A Sacriston businessman has claimed he could lose his home after a Tesco opened near his shop and post office. Stephen Sanderson, who owns the Village Shop, said his takings were down 30% since the supermarket opened last week. BBC research found that in the last two years, councils in Durham have approved 10 new stores for the 'big four'. Responding to the research, Tesco said it had invested in the UK economy despite the recession and had created thousands of jobs in deprived areas. The BBC contacted every UK planning authority to discover how many shops from Asda, Morrisons, Sainsbury's and Tesco received planning permission. The research shows at least 577 stores in the UK were approved in the two years to November. 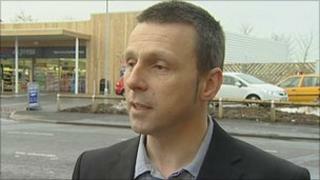 In County Durham, Tesco was given permission to build five stores, Sainsbury's three and Morrisons two. Tesco also has one store earmarked for Sunderland. Mr Sanderson said he had put £350,000 into the business and would lose his home if trade did not pick up. He said: "If I'm truthful about it I've probably sunk about £350,000 into the business so I had to put my home up as collateral. "So I could lose my home - I've already got it up for sale." A statement from Tesco said it tried to put customers first. It said: "The BBC figures are incomplete and misleading. Plans to build a Tesco superstore in Genesis Way, Consett, creating 250 new jobs, were also recently approved by Derwentside Council. The £18m supermarket will replace a smaller Tesco in nearby Delves Lane. It will also have 600 car parking spaces, as well as a petrol station and cafe.